In November 2018, our product team for the SAP Cloud Platform Discovery Center launched the “Discovery Center Challenge”. The Discovery Center Challenge is a contest through which users can earn over $2,500 USD in prizes for using the product. This blog is a case study for Product Managers who are interested in what prompted our team to invest in such a contest and how they could devise and deploy similar methods in their products. A common qualification that you see requested on job openings for Product Managers is “experience launching a product.” It makes sense. A Product Manager should have an entrepreneurial mindset and know what it takes to get a product from concept to launch. But that’s only half the battle. Actually, it’s more like a quarter of the battle. All Product Managers should be familiar with the product lifecycle and its four stages: Introduction, Growth, Maturity, Decline, refer to Image 1 below. Once the Product Manager and product team have launched the product and introduced it to the market, they have entered the first stage. The team must then get the product from the initial introduction to the second stage of rapid, habitual growth. For technology products, the movement between the Introduction and Growth stages brings to mind the technology adoption lifecycle model, refer to Image 2 below, and the metaphorical chasm between early adopters (i.e. visionaries) and the general public (i.e. pragmatists) that Geoffrey Moore proposes in his variation to the model. Often, to move between these stages requires the same methods as crossing this chasm. These methods must create a sort of “bandwagon effect” to build momentum (i.e. growth). There are numerous methods to enter the Growth stage and build the momentum necessary to cross “The Chasm” and push through this stage. One such method that I have been researching over the past year utilizes the “Hook Model” described by Nir Eyal in his book Hooked: How to Build Habit-Forming Products, refer to Image 3 below. This model describes ways that Product Management teams can leverage psychology in an ethically sound manner to build products that become default solutions to users’ impulses. The model begins with internal and external triggers. As an additional example, we can investigate the product that I work on, the SAP Cloud Platform Discovery Center. The SAP Cloud Platform Discovery Center has faced the same struggle as any product moving from the Introduction to Growth stage. Our early adopters have been technologists from “SAP shops”, companies that primarily run SAP software, who have been given a license to SAP Cloud Platform and are now experiencing the pain of figuring out what their company can do with it. But these early adopters are too few to constitute rapid, habitual growth. We have reached Geoffrey Moore’s metaphorical chasm and our Product Management team has been in full strategy mode to determine how to extend our reach to the general public. One result of our strategic brainstorming was our paid trigger which we named the “Discovery Center Challenge”. If your product team is also facing “The Chasm” and looking to utilize triggers to reach the next stage in your product’s lifecycle, I would recommend following the “Bullseye Framework” proposed by Justin Mares in his book Traction: How Any Startup Can Achieve Explosive Customer Growth. Our paid trigger is fairly simple: we will give you money to use our product. As you can see in my other blog announcing the “Discovery Center Challenge”, we are offering tiers of prizes that increase in value linearly with your investment of time and energy in our product. These tiers start at $25 USD for taking the first action and increase all the way to $2,500 USD (the price of a ticket to the 2019 SAPPHIRE NOW conference). This first action that we ask is to start a Mission; an endeavor that takes less than 5 minutes. We have this as the first action because a Mission is the basic building block of our product and embodies the value of what the SAP Cloud Platform Discovery Center provides. We are willing to give away money for starting a Mission because we believe that once a user takes that action the intrinsic value of the SAP Cloud Platform Discovery Center will become evident and these paid triggers will merely be icing on the cake. Why should HR care about an “extensibility” platform? What does it mean to extend SAP SuccessFactors with SAP Cloud Platform, and why should HR care? Triggers, including paid triggers, are just the first step of Nir Eyal’s Hook Model. 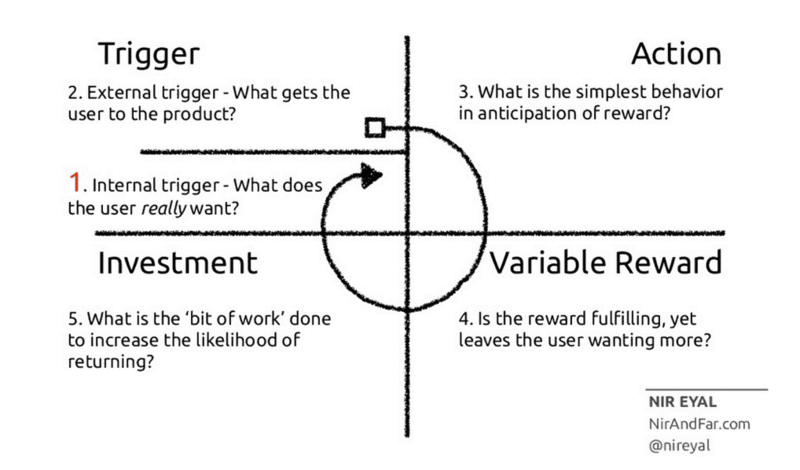 As you can see in Image 1 above, there are additional steps that Eyal proposes to create a habit-forming product. The Discovery Center Challenge is one of our methods to succeed at this step, and we won’t be able to determine the degree of its success until after the contest concludes in March 2019. I will continue to share Product Management insights cleaned from building the SAP Cloud Platform Discovery Center in future blogs. In the meantime, if you have feedback for the Discovery Center Challenge or the SAP Cloud Platform Discovery Center please let us know using the Comments section below. Additionally, if you are on a product team and have also faced the challenge of moving from Introduction to Growth reach out to me on LinkedIn – I love to talk product! Colin Kraczkowsky is on the Product Management team for SAP Cloud Platform and is currently building the SAP Cloud Platform Discovery Center. His domain expertise includes SAP SuccessFactors extension development on the platform.